Escape Room Games. Should you try one? You’ve likely heard of the Escape Room craze that’s been making its way around the country. A small group of people get locked into a themed room strategically filled with clues to help the group solve the room’s riddle and ultimately find the key that will let them out within the given time limit, usually one hour. But are they really any fun? Should you spend the money to try one? The short answer is yes, you should absolutely try one. The difficulty of the room is flexible. You may be thinking, “I’m no good a riddles so this probably wouldn’t be any fun for me.” Or alternatively, “I’m way too good at riddles. It probably wouldn’t be much of a challenge for me.” You’re not locked in the room an left to your own devices for an hours, unless that’s what you want. There is a surveillance camera and TV monitor in the room. The camera allows your room overseer to know what puzzle you’re working on and if you request a hint. The monitor will give you any requested hints and sometimes steer you in the right direction if it looks like you’re getting off track. If you wanted the room to be easier, you could let your overseer know this ahead of time and use the maximum amount of hints possible. If you wanted it to be more difficult, you could request to be given no help or hints whatsoever. Seeing as how you only have one hour, I think it’s more realistic to use at least some of the hints/assistance. I’m not sure we would have gotten through all of the puzzles in time if we hadn’t requested the hints we did. In our room, we were allowed 3 free hints. Meaning our time wasn’t penalized at all for asking for/using these hints. We received an additional free hint for solving a short puzzle before entering the room. Had we wanted more than these 4 hints, we would have been penalized 3 minutes per hint. We only ended up using 2 of the hints. Though we probably would have solved the room faster had we asked for the other 2. We ended up with a little over 18 minutes to spare. No matter your puzzle solving abilities, the game can be adjusted to make it fun. There are many different themes to choose from. Our puzzle was The Oval Office. We were supposed to “hack” into the computer, disarm the bomb and leave the room before time ran out. There was really no scary aspect to this theme at all other than the suspense of having a “bomb” counting down while you sort out your puzzles. I would love to try a scarier theme, perhaps with zombies or the like, but I know not everyone would enjoy that. In our town, there are about 7 different themes to choose from with more on the way. There really seems to be something for everyone. Having an odd or mismatched group of people can be beneficial. A big part of our success in solving the room, I think, was each person remembering different tidbits about the room that ended being important in solving different parts of the puzzle. One of the tips we were given beforehand was to take 5-10 minutes to just look over the room and take note of everything you can before attempting to start the first puzzle. When doing this, each person started on a different part of the room and ultimately, each person remembered different details that ended up being important. Something that I glanced over was remembered in much greater detail by someone else. Had I been the only one to see it, we would have never gotten through the part of the puzzle where that detail was important. This is probably one of the reasons activities like this are such great team builders. It allows people who think very differently to complement one another and be more successful because of it. The one caveat to this is you have to speak up and listen to the other group members. If you’re trying to solve part of the room and you don’t state your questions out loud so everyone knows what you need, the person on the other side of the room who remembers the detail that gives the answer can’t help you. Or on the flip side, if you’re not listening to your group members or are too shy to speak up, you won’t be able to offer up the details you remember that solve the question posed on the other side of the room. Random groups or even groups of strangers can be beneficial. Just remember to speak up and listen when others speak. You can go in with a complete group, but you can be assigned to a group if you’re solo as well. Each room has a minimum and a maximum number of participants allowed. We were lucky to have the minimum number of people to complete the room in our group already. We didn’t have to pay for the 2 spots that weren’t used, but if someone had shown up that night wanting to join a group, they would have been put with ours. So if you don’t have 5 friends who what to try it, you can still sign up. Depending on how busy the business is in your town, you may be able to be added to a group that’s already signed up but hasn’t reached the max number of participants. If it’s a smaller town, you may need to be more flexible and come on a night when rooms are booked with a few spots available. Call or email the business directly and let them know you’d like to join a group. They’ll be able to coordinate everything and get you in with another group. You can bring your kids! We didn’t have any kids in our group but so long as each child under 16 is accompanied by an adult, they can join in the fun. While they may not be super helpful in solving the puzzles if they’re too young, the fact that they can come along and watch their folks solve mysteries means you don’t have to find a babysitter. They’re quite literally locked in a room with you so it’s not like there’s much trouble they can get into. I know a lot of our parent friends out there find it hard to get out and do activities with other adults. This really seems to be a great compromise. It’s only and hour, your kids can come along and you get to interact with other adults. Win or lose, the puzzles are interesting and fun. Granted, we’ve only tried one room so far and we solved that room so I may be a bit biased. Even if we hadn’t solved it though, I’d be much better prepared for the next room we tried and it was still a ton of fun. The location we went to also makes donations to charities and because we solved our room, each participant got to choose which local charity they’d like to donate to. As if we weren’t happy enough after solving our room, this made the win that much sweeter. Pay attention to their tips. Things like “don’t be too stubborn to ask for hints” and “everyone should work on one puzzle at a time” end up being much more important than you may initially think. Read through all of the tips they give you carefully and better yet, utilize these tips. Go to the bathroom just before you start the room. Your overseer will likely point this out anyway but you’d be surprised at the stress all of the excitement and adrenaline of the room can put on your bladder. Opening the door before the room is solved means the group fails the room so don’t be the party pooper. (pun intended :P) Hit the bathroom ahead of time. Decide as a group ahead of time whether you’re trying for best time, whatever it takes to solve the puzzle in time, or just to have fun. Especially if it’s your first time, I’d just shoot for fun. It may be worth it to decide ahead of time whether you want to use the free hints or not. Everyone has to agree to signal the overseer for the hint if you want it. The overseer won’t give the hint if only one of you is signaling. Why waste the time asking the group to signal for a hint if some of them already have it in their head they want to try to complete it without hints. Best to sort that bit out ahead of time and enjoy whichever method the group has settled on. Clarify with your overseer ahead of time what the specific goals of the room are. There was a lot of commotion and excitement before heading into the room and I think this part was almost overlooked. There are specific tasks you’ll need to do in a specific order to win. These may not be obvious so it’s good to clarify the details of the story of the room and your exact tasks before the game begins. Speak up, pay attention and have fun! This is definitely an interactive and cooperative game and you really need to go all in on both to get the full experience and have fun. Talk to your group members and listen to what they say to have the best chance at winning and enjoying the game. There are only a few instances I can think of where I would not recommend an Escape Room to someone. If you’re claustrophobic, this likely will not be for you. Although if it’s not an extreme case and you want to try it out, they do always have an emergency key available so you can leave whenever you may need. Leaving before the mystery is solved however, means the entire room fails the game. Probably best to sit this one out if there’s any chance you won’t be able to stick it out for an hour in a smallish room with 6-12 people in it. Our room was probably around 12’x12′ so not tiny but once you put all the furniture and people in there, I can definitely see it being a problem for anyone who doesn’t like small spaces or being in close quarters with other people. If you don’t like interacting with others or meeting new people. Even if you go in with your own group ahead of time, you still need to interact with your overseer to be successful. Any way you slice it, you have to work with others. If that’s not your cup of tea, you may be better off sitting this one out. If games and puzzles aren’t your thing. I’m guessing if you’ve read this far, you probably enjoy some sort of games but there are those out there who just don’t. If you’d never choose a game night over movie night, you might want to skip Escape Room night and check out that new movie instead. What about that Escape Room board game? Honestly, I haven’t played it yet. One of the things I loved so much about the real Escape Room was the fact that it was an actual room with actual props to interact with. It just adds a whole other level to the experience that I can’t see cardboard cutouts replacing with any success. It’s a game night that can technically be considered a night out. For homebodies like us, that’s a huge win. I’m sure I’ll try the board game version eventually and I’ll be sure to update this post when I do but I can’t say I’m chomping at the bit to try it. I AM super excited to try a different themed room. The room we tried was The Oval Office where you have to hack into the computer, diffuse the bomb and leave the room to win. Zombie Pets, The Cabin and The Insane Professor are the next rooms at the top of my list at the moment. Here is a link to the location we’ve been to. Brainstorm Escapes The staff was incredibly nice and helpful there. Definitely added to the fun we had that night. What about you, readers? 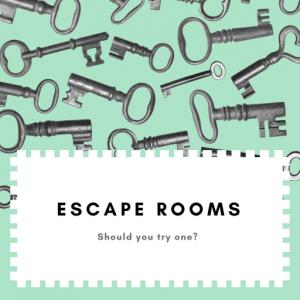 Have you ever tried a real Escape Room or the board game version? What did you think? Any recommendations? Comment below! That sounds like a good idea to read through and use the tips the escape room people give you. My friends and I want to get together and do something really fun. I think that an escape room would be lots of fun for all of us. We’ll have to find one near us.